Sure, sure. Hina can have the cover this time. I do not mind. 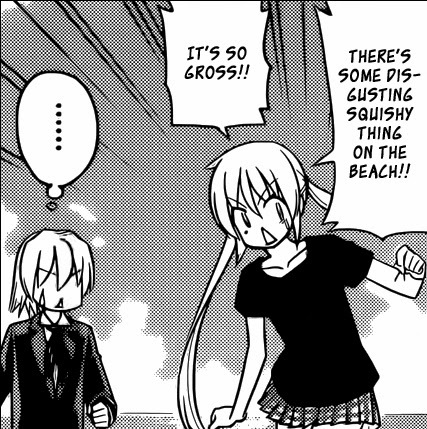 Synopsis: Hayate rushes towards Nagi who turns out to be screaming about nothing but some dead jellyfish. After confirming that his mistress is fine, Hayate turns back towards the possessed Yukiji (Higanman) and Ikusa and it appears that Higanman has turned super saiyan because of the King's Jewel. Yukiji: Sekai de ichiban o-bake sama! 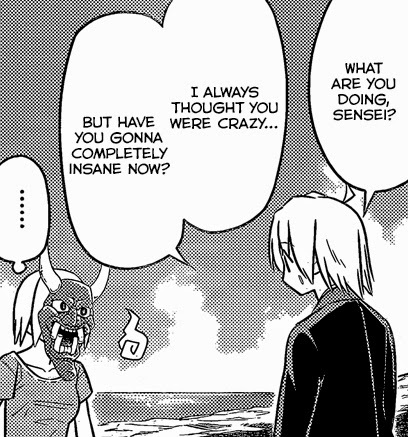 Nagi asks WTF is going on here and Hayate briefly explains that Yukiji's been possessed and her powers have been amplified by the King's Jewel. 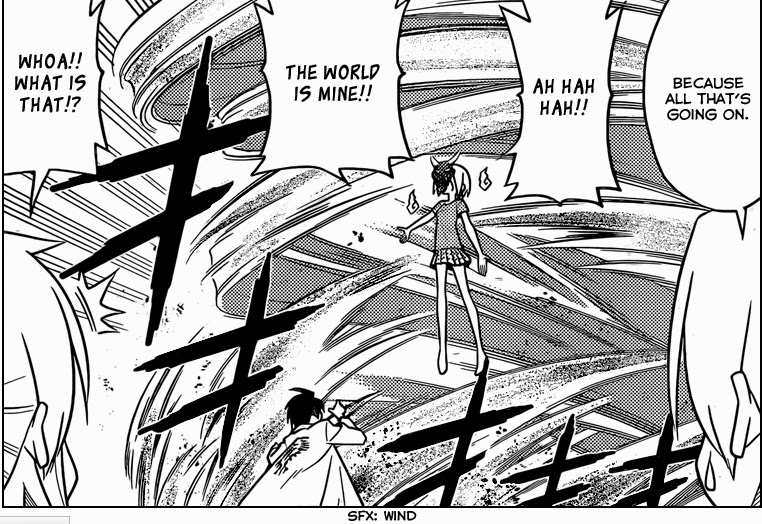 Ikusa says he can't even touch her when she's that powerful, but Nagi has a plan. 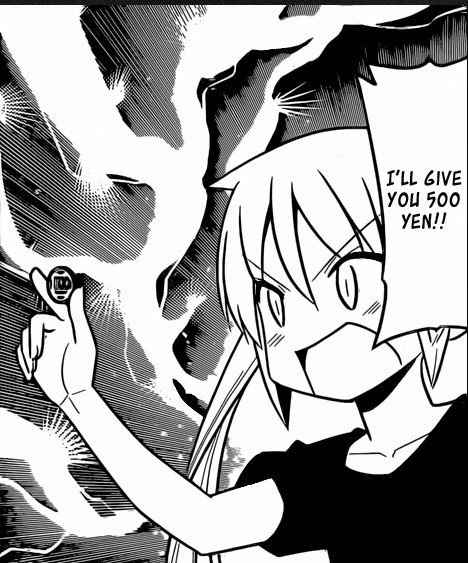 She rushes up to Yukiji and then proceeds to bribe her with 500 yen into purifying the evil spirit. Higanman is stopped dead in his tracks and he can't believe that he's geting defeated by a mere 500 yen. 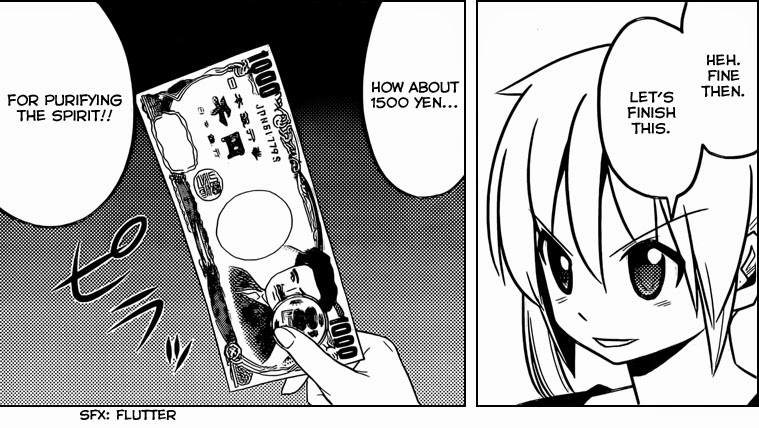 Yukiji asks for just a little bit more, so Nagi ups the ante up to 1500 yen for purifying the spirit. I guess she does tend to solve everything with money, eh? This time, it really does work and the spirit is purified bathing Yukiji's body in some kind of magical array of lightning bolts. The ghost isn't done just yet though. In order to get some kind of revenge on Hayate, he decides to throw away the pouch containing the King's Jewel into the ocean. Hayate and Ikusa team up and Ikusa throws him towards the pouch, but just as the pouch is within reach, the Jewel slips out and is then struck by a stray bolt of magical lightning -- presumably from the evil spirit. Hayate falls into the ocean feeling defeated and Ikusa dives in to rescue him. Hayate says that he did it again and Ikusa responds by saying that he just has to apologize again while handing him the pouch that contained the King's Jewel. Review: Really action-packed chapter here. Naturally, Nagi stole the show -- quite fittingly. If you ever doubted the awesomeness of Nagi Sanzen'in, let this chapter clear your doubts. I'd thought that Hata would make Nagi the damsel in distress again, but she turns out to be pretty useful in defeating "Higanman" - using her brains to outwit the evil spirit and exploit Yukiji-sensei's personality. Looks like one of my speculations finally came true here because I did say that it might just be something insignificant in the previous chapter review. 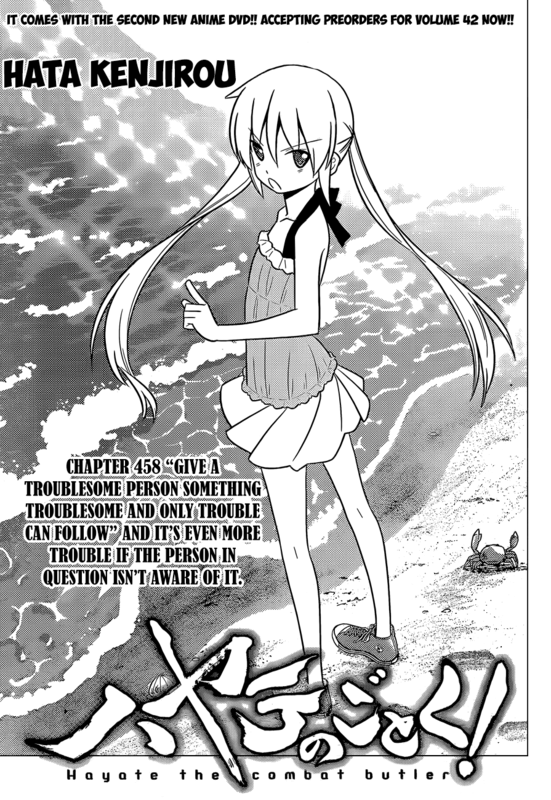 Also, I was just joking around a bit about Ikusa x Hayate being a thing, but that panel on the last page sure looks mighty suspicious. 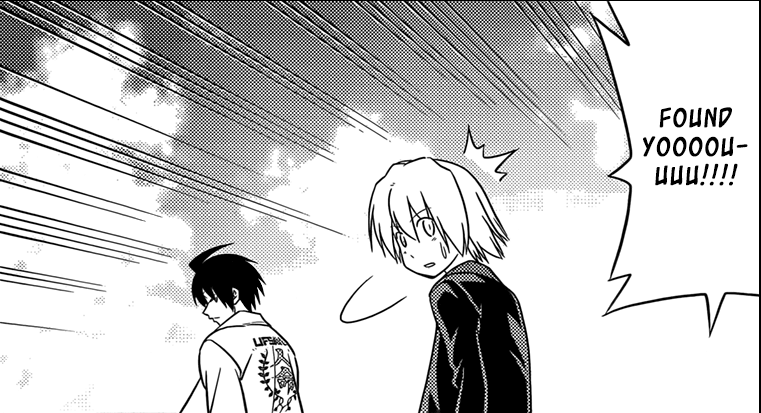 On things other than Nagi, I noticed that Ikusa was calling Hayate by his name here and he seems to impliedly acknowledge everything that Hayate said in the previous chapter -- he even treats him more like a brother now -- which is a good thing. Anyway, a very fun fast-paced chapter and it gave Nagi a chance to shine. I'm a bit disappointed in Hayate being so helpless throughout all of this though. Still, now that the King's Jewel that he was after has been broken, it either needs to be repaired (which I doubt) or he'll need to find another one to restore the Sanzen'in inheritance to Nagi. Either way, I think this beach arc is just about ready to be wrapped up now. Speculation Fanart Corner: Okay, not going to bother with speculations this time as this looks like a penultimate arc ender and I really do have nothing to work with this time around. Instead, I'll just show you another piece of fanart requested by some Goddess of Gensokyo. Also, I still don't encourage more fanart on the subject matter. OMG! Look at Nagi hogging the spotlight! I mean, she's only the CO-MAIN Character, after all. Why does she have to be in this manga all the time, huh? Synopsis: Nagi wakes up inside the hotel room and after complaining a bit about “working so hard,” she starts thinking about how Hayate is doing right now and that she should help him as his master. Outside the room, she gets a glimpse of Isumi walking past. She sees Maria and asks her about Isumi but Maria says she hasn’t seen her. No captions necessary (I'll type one in anyway). This one is just pure lulz. 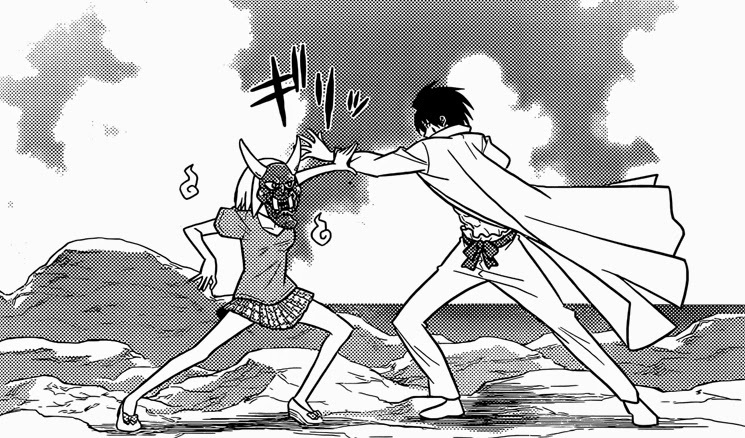 Back at the beach, Hayate and Ikusa are confronted with the “mystery person” from the previous chapter and it turns out to be Yukiji in a mask. She starts calling herself “Higanman” and claims to be seeking revenge on Hayate for yesterday. It seems that the ghost who was possessing Hinagiku has been transferred to her and the ghost now wants revenge on Hayate for taking his treasure (all that boxed curry from the island). Ikusa calmly deduces that she’s been possessed. An amusing conversation between Hayate, Ikusa and “Higanman” ensues and Ikusa vows to defeat this evil spirit as a lifesaver, but Higanman argues that hurting him will hurt Yukiji too. Of course, Hayate knows how durable Yukiji is, so he has no qualms about it and tries to strike her right in the face, but she successfully evades at least three successive blows from him (two are offscreen). 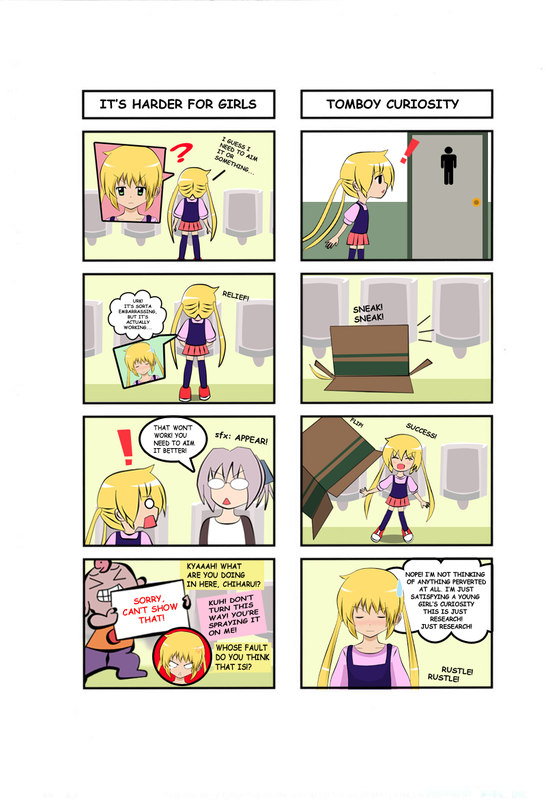 Hayate eagerly tells Ikusa to go all out on Yukiji since she can take it. Higanman fires some kind of spirit hadoukens at Ikusa, who effortlessly dodges them and then moves in for the finishing blow, but he is taken by surprise when Yukiji blocks his attack with one hand and uses some kind of spirit blow which pushes him back several paces away. The evil spirit relishes the strength of his host body and shows that he’s even managed to steal Ikusa’s treasure in the scuffle. Ikusa says its war if he doesn’t return it, but the Higanman is unperturbed by his threat. Suddenly, the pouch glows and gives the ghost even more power and Hayate concludes that it’s because of the King’s Jewel inside, but Hayate’s attention is then taken away with a nearby scream from Nagi. Review: Whoo! Lots of stuff happening here and another Nagi cover FTW! First of all… all of my guesses as to who the mystery person might be were dead wrong as it turned out to be Yukiji who has presumably contracted the ghost who possessed Hinagiku and made her sick. 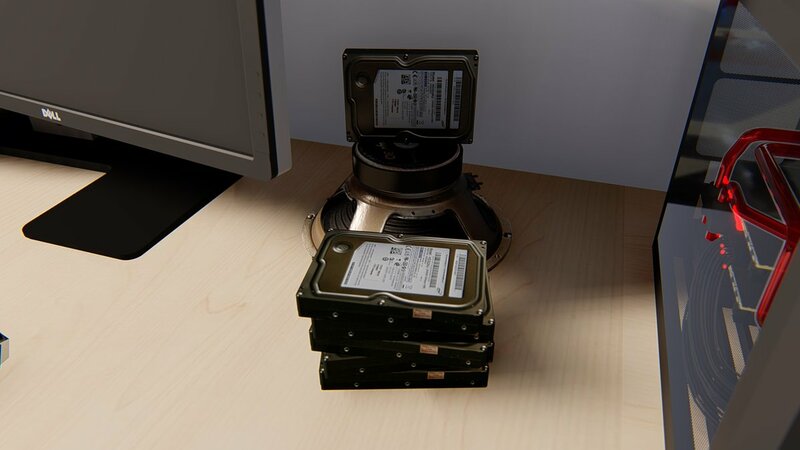 Pretty sure someone guessed this scenario correctly in one of the forums and/or blogs that I lurk, but I can’t remember who. Anywayz, props to you whoever you are, mystery soothsayer person. Secondly, wow! Ikusa’s huge! Did you see the difference between him and Hayate? 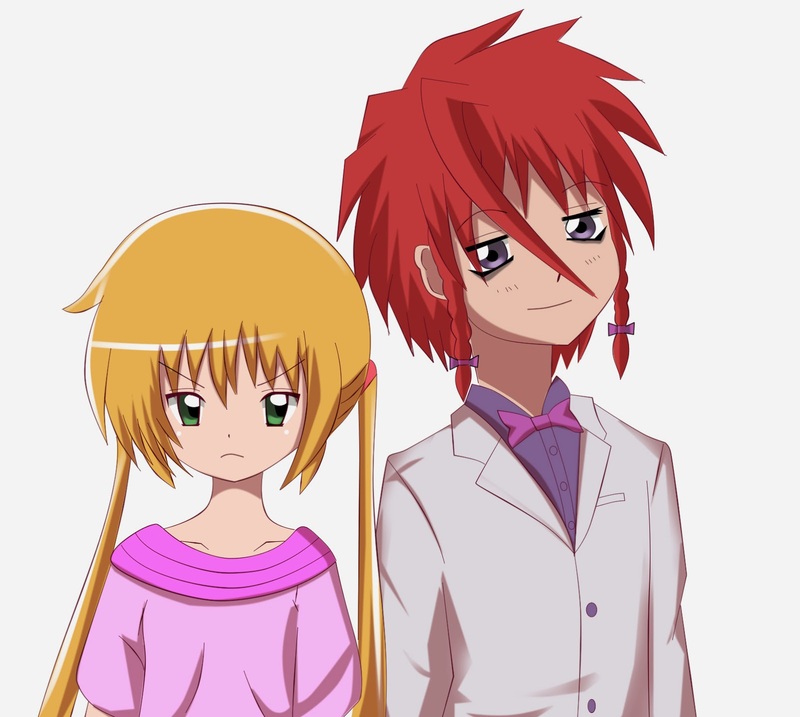 Ok, so maybe Hayate’s in semi-chibi form, but how about how he towers over Yukiji? Betcha he’s at least 183-185 cm. Ikusa: Hmph! Don't get cocky. I'm only using 10% of my powers! This chapter establishes several things at least. Now we know almost for sure that the King’s Jewel really is inside that pouch as it gave the ghost some kind of power. So if it’s not the King’s Jewel, then it has to be some other kind of magical artifact, but it’s highly unlikely to be anything else at this point. 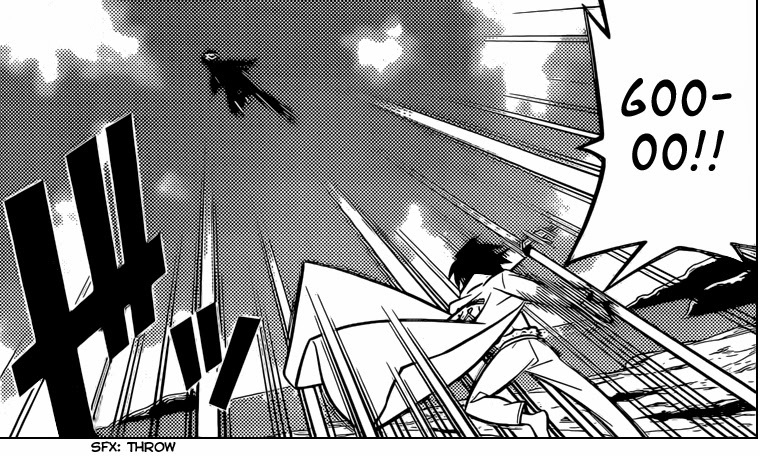 This chapter also establishes that both the Katsuras are really top-tier in terms of strength in the Hayateverse with the way Higanman in Yukiji’s body was able to block a blow from Ikusa. Granted, it probably wasn’t a 100% committed blow, but remember that Ikusa has stood on par with Athena’s magical memory recover hammers with just his physical strength alone and has cut off King Midas’ right arm with the Shirousakura pretty handily. Anyway, enough about Ikusa. Let’s talk about Nagi for a bit. I like how Hata sorta redeemed her character a bit in this chapter what with her getting tired and giving up so easily the last time. This chapter shows that she still cares for Hayate even though she did bail out on him and she’s actually eager to get back and help him out after she’s rested up a bit. With that said, it seems that she’s in trouble again and needs rescuing according to the cliffhanger in the previous arc. 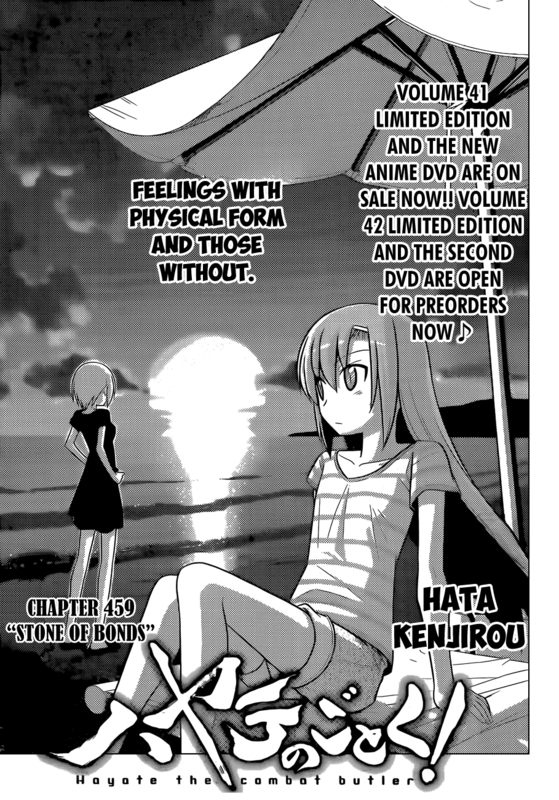 All-in-all, this was another great fast-paced chapter for the beach arc. I wouldn’t say it was worth a one-week wait, but Hata does deserve a break every now and then with the way he’s been churning out these chapters fairly regularly. Naturally, I have no idea what Nagi is screaming about this time. Speculation Corner: Okay, I’m honestly all out of guesses here as to who Nagi’s mystery tormentor/abductor could be. Hata just makes it impossible to guess with the lack of information before these cliffhangers – which isn’t a bad thing, btw. I’m just pointing it out. Anyway, I’m gonna go with Yozora Housen on this one… or it could be that she’s just screaming over something absolutely trivial like a giant cockroach getting in her way or something. Okay fanart time, so that Goddess of Gensokyou from last time requested this one too. I kinda like how moe her face turned out here… although I do not (openly) encourage more fanart on the same subject matter. If you don't get the scene in this image... good! You don't want to know. This is other one is also fanart request from a Hintko-chan. Naturally, I don’t support this pairing… with that said, if Hayate continues to be a dunce about Nagi’s feelings, I wouldn’t mind if Himegami or some other new male character started showing interest in her and she actually responded. At least we know that Robot 13/13-kun got a rise out of him a few hundred chapters ago. I’d like to see how he responds if a real rival (other than the Hamster’s brother) started showing some interest in Nagi. I mean, Maria got all those letters from the boys when she was Nagi’s age and I don’t see Nagi losing to her in terms of looks (when they were the same age… nah, Nagi’s way cuter), so why shouldn’t she have a few admirers of her own? Anywayz, that wraps up this review. See ya in the next chapter! 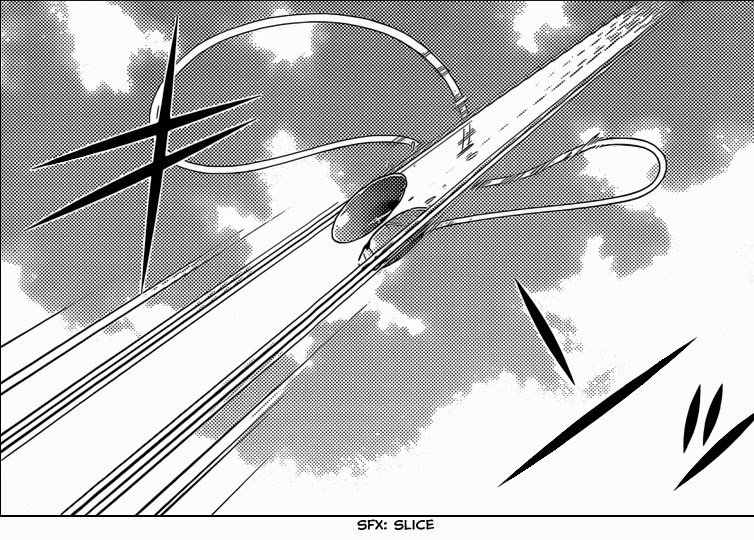 Synopsis: Hayate realizes something about this competition due to Fumi and Yukiji's antics. He thanks both of them sincerely and sends Yukiji along to the hotel to look after Hina. He also sends off Fumi to go and help some other people at the beach after thanking her properly. 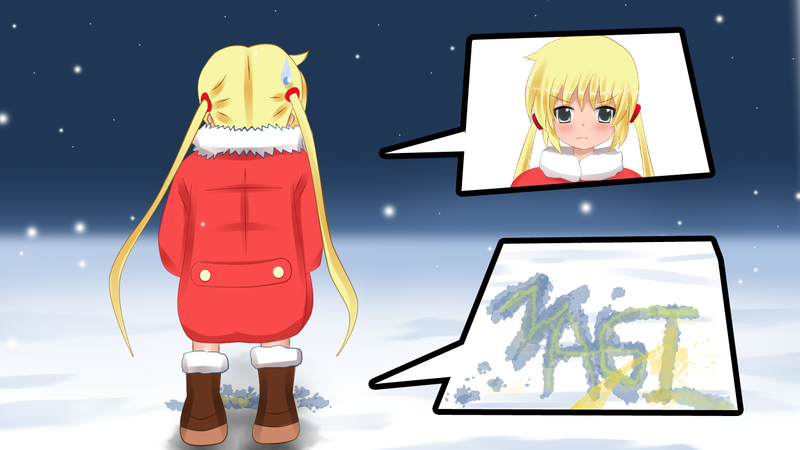 Hayate finally realizes that he was being a jerk. Souya and Kotetsu arrive at around the same time and Hayate actually treats Kotetsu like an actual human being this time. He asks Souya where he can find Ikusa and then leaves the restaurant in Souya and Kotetsu's hands. 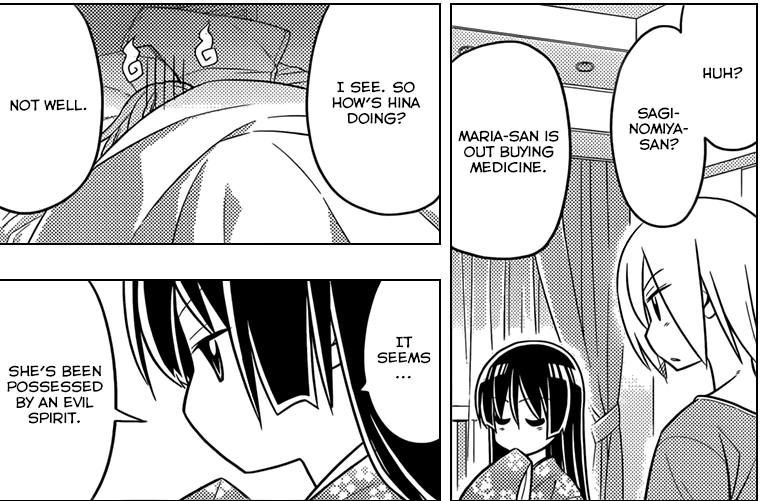 Meanwhile, Yukiji has arrived back at the hotel and Isumi is tending to Hina who has apparently been possessed by an evil spirit -- but with the same symptoms as a cold. Isumi tells Yukiji that Hina'll instantly recover if someone else gets possessed by the evil spirit -- just like a normal cold. 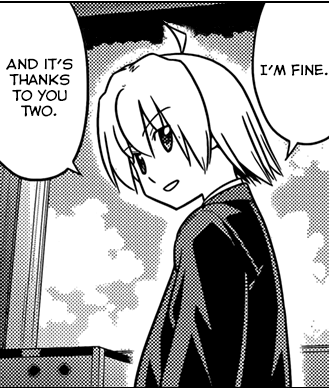 Hayate finds Ikusa and they finally have a heart-to-heart talk as brothers after ten years. Hayate reveals that he understands why Ikusa made him go through this competition and that he would have given the "treasure" to him win or lose. Ikusa doesn't seem to disapprove, but he still claims that he's not Hayate's brother but that if his faint memories of his brother and family are true, then he would have been proud to have a brother who survived such a past and grew up to be so honest. The talk is interrupted by someone exclaiming "found you," but we'll have to wait some time before the next chapter since the manga is taking a one week break. Review: This was a pretty good chapter. For once, things went as I would have liked them to and Hayate received some degree of character development here by realizing that he was taking the wrong approach the whole time. Hayate was focused on winning the battle (the competition with Ikusa) when in fact, he wasn't looking ahead at the war (the reason Ikusa made up this competition in the first place). Thanks to his experiences during this beach arc, he now realizes that the competition itself didn't really matter and that he was actually being a jerk to his friends the whole time all because he was so dedicated to getting Nagi's inheritance back. I have to commend Hata-sensei for his use of psychology in this arc (in the whole manga, actually... but that's a story for another day.) From a psychological standpoint, Hayate thought that winning the competition was the only way to get his "treasure" back from Ikusa, but thanks to the ridiculous things mentioned by both Yukiji and Fumi, he realized that this whole thing wasn't about winning at all. It was really just all about finding out what Ikusa's motivations were really all about with this whole competition. We could say that it's because he has an 8.92 million yen debt, but Nagi already disproved that assertion 3 chapters ago and Ikusa himself confirmed that it was initially just a joke. 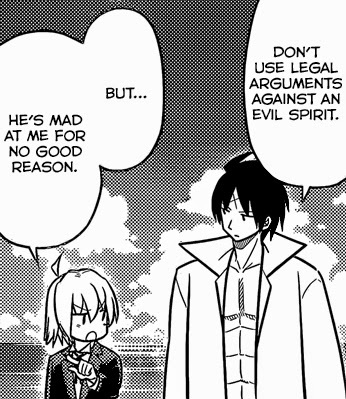 Thus, you could say that Hayate used a bit of psychoanalysis on Ikusa here. In any case, I appreciated the talk between the brothers and with things all but wrapped up, I think this beach arc is finally coming to an end. I'd say we have 4-5 chapters or maybe even less to fully wrap up this arc. At least we know why Isumi's here now. I like how things tie in quite neatly in this arc like Isumi suddenly showing up from out of nowhere in the previous chapter. Here, it's revealed that she probably showed up in order to help out Hina because she sensed a ghost or something. I really enjoyed the comedy here which is really a throwback to the tone of the series before the serious Athena arcs took precedence. 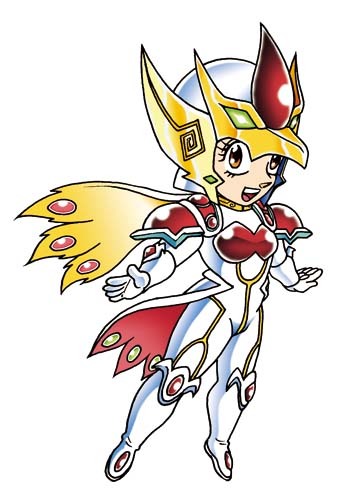 Don't get me wrong, I liked the Athena arcs (mostly because of Nagi's chapters), but I didn't really find them to be all that special when compared to the other arcs (or lack thereof) in the manga. Who do you think this is? You have 3 guesses! Make em count! Speculation Corner: Well, there was a cliffhanger with some voice going, "found youuuu!" at the end of this chapter, so we'll focus on that for this speculation corner. I have 3 guesses. Ruka Suirenji: I think that it's nice that Hayate realizes that he doesn't have to win this competition, but it would be even better if he actually did win -- and having Ruka show up and helping him win the competition with the help of her fame and camera crew is one of the best ways to win. Sakuya: Well, Isumi's here. Even though the two aren't always together nowadays, I wouldn't put it past Sakuya to show up and somehow help out. She could do a lot just by herself and with her two butlers as well as machina, or she could just use her wealth to help out somehow, although I don't think Hayate would appreciate that. Nagi and company: Although Nagi and Hamster just recently bailed out, I wouldn't put it past them to come back -- this time together with everyone else in order to help out Hayate. Regarding what Ikusa said about someone that he could grow to love in the previous chapter, I jokingly said in a comment that the one who best fits his description would be Hayate -- perhaps this chapter proves what I said to be true after all? In fact, Ikusa never stated outright that it was romantic love that he was referring to. Finally, I finished drawing this fanart of Nagi (again) just in time for this week's chapter review. What do you think? Isn't she cutieful? This is also requested by some Goddess of Gensokyo. Nagi! Nagi! Nagi! Nagi! ... Nagi!